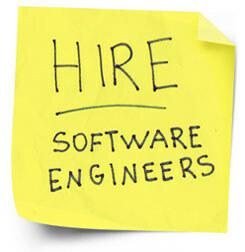 Competition to hire software engineers who can build iPhone and Android mobile apps is intense. Some of the best and most used mobile apps in the business are built by Xtreme labs (now part of Pivotal Labs) in Toronto, Canada. Xtreme grew from 10 to 350 people in 4 years. What’s the secret that drove over 25% of their mobile development hires? Bribe ‘em: Bring a few PS4s and iPads to career fairs. Tell engineering students that all they need to do to have a chance to win one is drop off a resume. This hack allowed tiny Xtreme to collect more resumes than virtually everyone else. Press the flesh: Farhan goes to career fairs himself. He meets people in person, selling the opportunity one-on-one and his goal at career fairs is to actually make hires. He gives prospective interns simple programming problems to solve in person, on paper, and then reads the code they hand back to him. If he likes the code, he hires them on the spot. Real work: Each intern is paired with a full time employee for the duration of their internship. Interns don’t do “intern projects” – they are integral parts of teams that ship real world systems for well known brands. Hire early: Make full time job offers years in advance, sometimes before an internship is even over. They pay signing bonuses immediately to hungry college students, not in a year or two when they’ll start full time. Once they sign they are treated like full timers from that day forward: they are given company schwag, issued company email addresses, cc:ed on company correspondence and invited to events. After signing they are free to finish their studies and even intern at other companies knowing that they have a home. Thawar says “Go find out what it’s like at these other companies and then come back to us,” Only one engineer has ever failed to return. Intrigued? See Farhan’s full talk from HireCamp below for more great ideas.